The friendly city of Auburndale, located in the very heart of Central Florida and the home of Adams Cold Storage (ACS), is about as landlocked as a city can be in the Sunshine State, but that hasn’t kept our company from being in the mix of things in a business based in deep water — the cruise liner industry as well as food exports to the Caribbean islands. When it comes to making hungry passengers happy aboard the huge and luxurious cruise ships that ply the waters off Florida’s coastline, ACS is a link in the cold supply chain that helps to keep many ships and islands stocked with food. “(A) mix of younger travelers, favorable economic conditions and a broader shift in consumer habits (worldwide) created tailwinds for the industry,” the news report stated. One result of that is a boost in the amount of ship-bound food coming into and leaving public refrigerated warehouses like ACS. Anyone who’s ever been on a cruise, or anyone familiar with the industry, knows that these ships take aboard a huge quantity of food when they’re at dock in ports Miami, Fort Lauderdale, Canaveral, Key West, Tampa and elsewhere. They have to; a lot of eating goes on during a cruise — it’s nonstop in the main dining room and multiple themed dining halls that remain open for passengers around the clock. The crews have to eat, too. I recall a time, in a prior business life, when my company supplied a quarter of a million pounds of rice a month — the equivalent of one rail carload or three semi-truck trailer loads every other week — to a few cruise lines with a large number of Asian crew members. That went on for a couple of years. I’ll continue with this topic next month, with some information about the food distributors we work with at ACS on behalf of the cruise line/overseas container companies and the kinds of products we store. This column is sponsored by Adams Cold Storage, LLC. 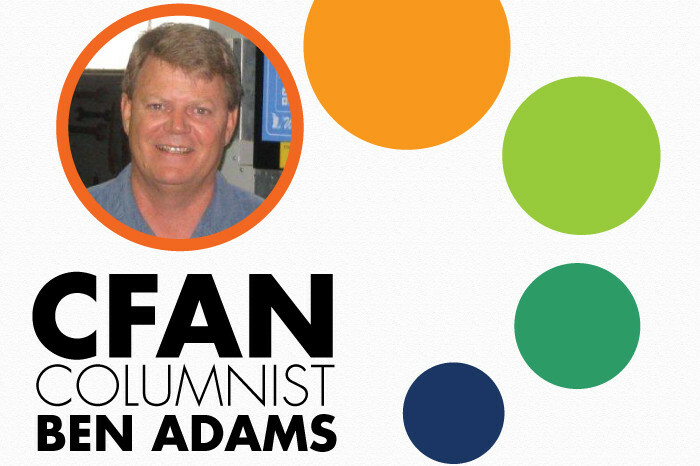 BIO: Ben Adams, Jr., is an owner and president of president of Adams Cold Storage, LLC, in Auburndale. He has been directly involved in citrus production, warehousing, and distribution, as well as state and community support, since 1980. His facility incorporates some 250,000 square feet of multi-temperature warehousing and is AA rated by BRC-International.